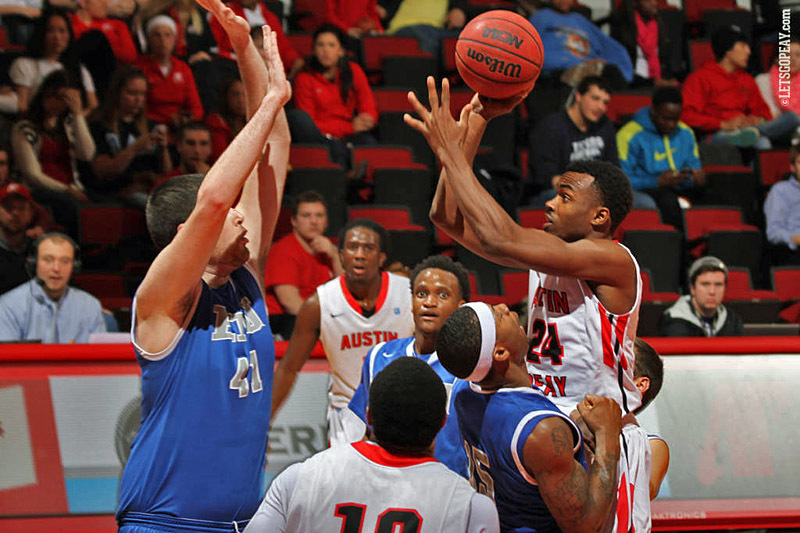 Clarksville, TN – Ed Dyson recorded his career’s first double-double with 24 points and 11 rebounds and Travis Betran added 23 points, including four key free throws in the final 30 seconds, to lift Austin Peay State University to an 88-83 win against Eastern Illinois, Thursday night, in Ohio Valley Conference play in the Dunn Center. The victory improves the Govs to 11-14 overall and 5-6 in the OVC, remaining solidly in the hunt for a league tournament berth. Eastern Illinois, meanwhile, falls to 9-16 overall and 6-7 in the OVC. 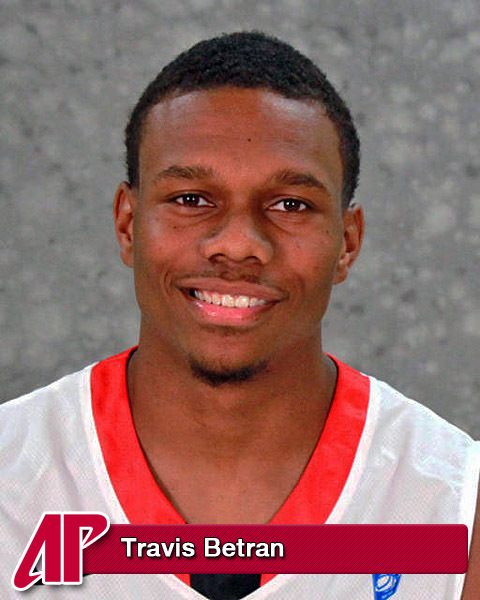 With point guard Damarius Smith out for his second straight game with an ankle injury and leading scorer/rebounder Chris Horton (four points, 3 rebounds) struggling through his season’s worst performance, it was the Govs wings—the junior Dyson and the senor Betran–who came up big. They combined for 12-of-15 floor shooting, including 5-of-8 from three-point range. It was Dyson’s fourth straight double-figure scoring game, including a pair of 20-point outings. Betran, meanwhile, tallied his seventh 20-point outing this season and 18th of his career. The Governors, who jumped out to a 22-9 lead and never trailed in the first half, saw Eastern Illinois take an early second-half lead, 41-40, when Sherman Blanford scored on a layup—it was two of the senior’s career-high 32 points to go with 18 rebounds. The Govs immediately reclaimed the lead on a Will Triggs layup and pushed it out to a seven-point advantage on Zavion Williams layup and back-to-back Dyson layups. Eastern Illinois hung close, slicing the lead to four before Betran and Dyson combined for a 7-0 run—Betran sandwiched a three pointer and lane jumper off a double screen around another Dyson layup—to give APSU a 59-48 advantage with 10:28 left. EIU again cut the deficit to seven with 9:11 left before back-to-back threes by Williams and Betran again made it a 13-point game. The game remained mostly in double digits much of the way until the final minute when EIU began finding the three-point range and the Governors clanked free throw after free throw. In fact, the Govs missed 7-of-9 free throws in a 30-second span while Dylan Chatman hit back-to-back three pointers followed by teammate Jake Verhagen’s three. That left EIU down by three, 82-79, with 31 seconds left. 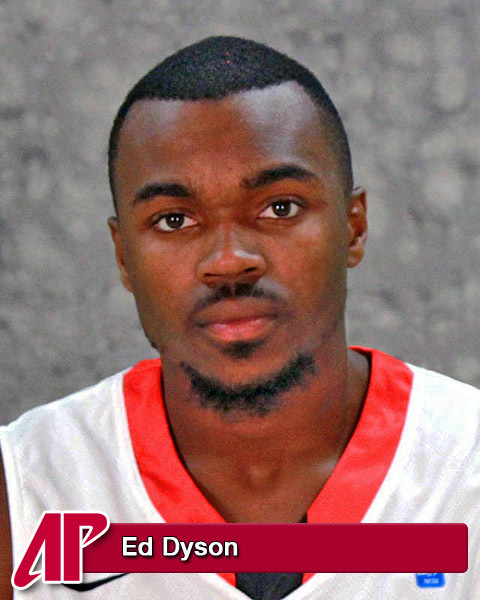 But the Govs finally found their best free-throw shooter, Betran, who calmly made four straight in an eight-second span, offsetting a Chatman layup. When Serigne Mboup blocked Blanford’s shot with seven seconds left and was subsequently fouled, the Govs finally put away the stubborn Panthers. In addition to Dyson and Betran’s 20-point outings, Williams added 15 points and Triggs 10. The Govs finished the night shooting 56.8 percent (25 of 44), including 7-of-10 from three-point range. After going perfect (12 of 12) in the free-throw line in the first half, the Govs were just 19 of 33 (57.6 percent) in the final half. Chatman matched his career high with 19 points while dishing seven assists. The Panthers bounced back from a 11-of-27 first-half shooting performance to connect on 20-of-36 (55.6 percent) in the second half. Points in the paint-EIU 30,APSU 26.Points off turnovers-EIU 17,APSU 21. 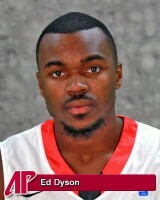 2nd chance points-EIU 13,APSU 7.Fast break points-EIU 6,APSU 9. Bench points-EIU 20,APSU 12.Score tied-0 times. Lead changed-2 times. Last FG-EIU 2nd-00:01, APSU 2nd-02:49. Largest lead-EIU by 1 2nd-18:07, APSU by 13 1st-11:19. Officials: Andrew Walton, Rick Shoulders, Mark MorrisonTechnical fouls: Eastern Illinois-None. Austin Peay-None.